Samsung Electronics will play host to a new wearable device on its stand at Mobile World Congress next week: a smart shoe. The sole of the Iofit sneaker is loaded with accelerometers and pressure sensors that communicate with a mobile app, making it easier for coaches to provide personalized tips for different sports. Created by former Samsung employees at the company's C-Lab business development center, Iofit is intended as a replacement for an existing coaching aid, the force plate, in which the pressure sensors are embedded in the floor. Moving the smarts to the shoe, and the coaching function to the phone, will open up such high-tech training support to new markets, its developers hope. Iofit's array of sensors allow it to monitor the how wearers shift their weight from one foot to the other, and how they balance. 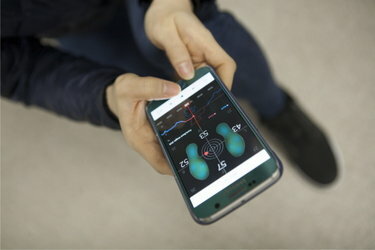 An app paired with the shoes can display a real-time pressure map of the soles of their feet, and even link it to a video recording of the wearer's movements. But, say Iofit's developers, providing data alone is insufficient. To be useful as a training aid, something like Iofit has to help them interpret the data and obtain coaching advice. 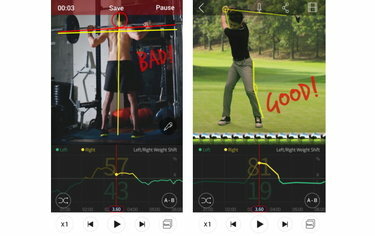 To that end, the Iofit app allows wearers to analyse their movements and compare them with saved videos. Coaches can annotate the videos, providing tips without having to be present, or even online at the same time. Salted Venture, the company created to sell the technology, is hoping to partner with sports shoe brands to bring it to market.